Why Use a Pickup Truck Magnet? Magnets easily attach to a pickup truck. 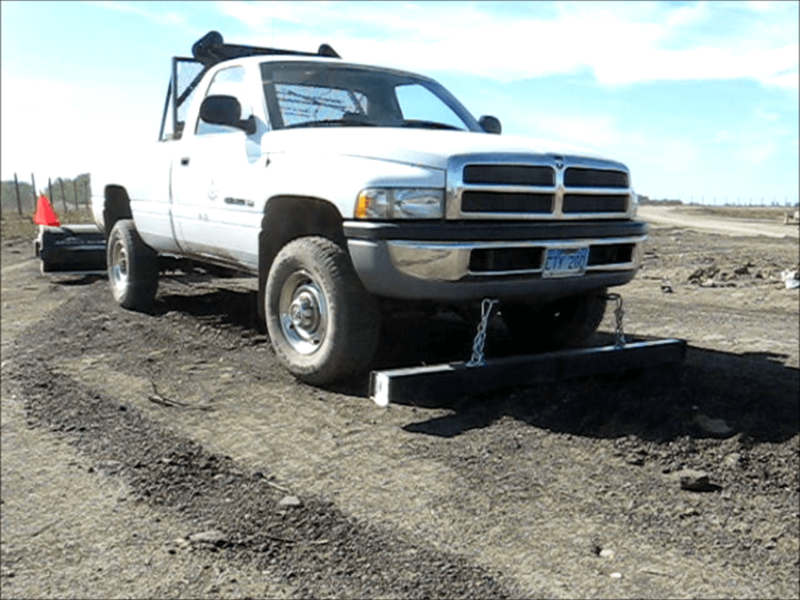 Sometimes a pickup truck is the only vehicle available to use for magnetic sweeper. But pickup trucks are versatile and magnetic sweepers can easily be attached to them because they have a high load capacity for towing and front mounts. If it is the only vehicle available and a serious debris problem exists, this can mean that you have to use a front mount magnet to protect the tires from flats. 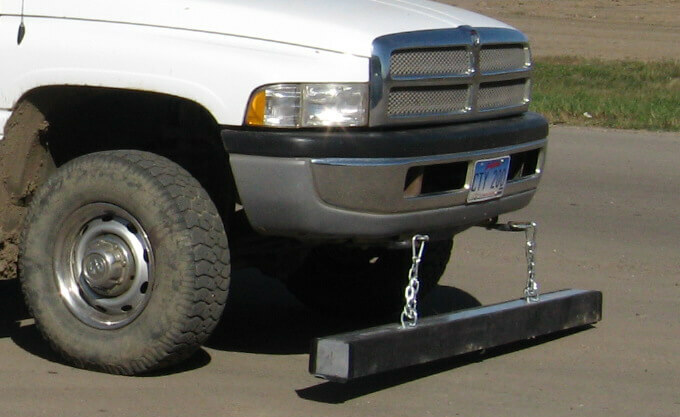 Pickup trucks are also great for towing larger magnets to clean large areas regularly to keep them free from debris. 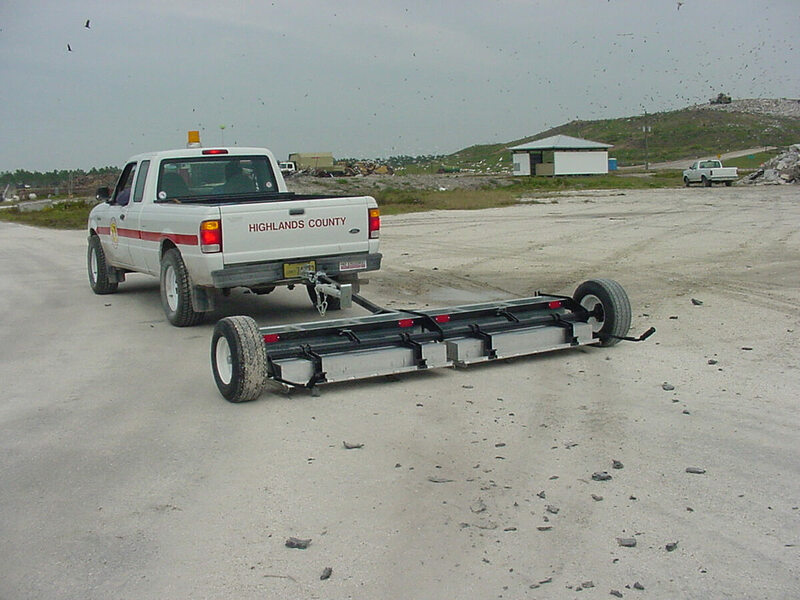 Front mounted magnets are mounted similar to a snow plow, they allow you to pick up debris before you drive over it, but they also tend to be more expensive. Tow behind magnets come in a number of varieties to suit different uses. Hanging magnets usually are hung from the front of the Pickup Truck like a Front Mount magnet to allow you to pick up debris before you drive over it. 1. How much suspension does your pickup truck have? Trucks obviously have suspension and they absorb bumps but when they do, the height of the truck from the ground changes, and therefore any hanging magnet can hit the ground. The rougher the ground, the more likely this could happen. So what’s going to prevent the magnet from hitting the ground if your truck suspension compresses 4 inches, or if it does what will protect the magnet? It’s something to consider when selecting a hanging magnet. 3. How much do you want to spend on a pickup truck magnet? A Pickup Truck has to be used for other tasks. 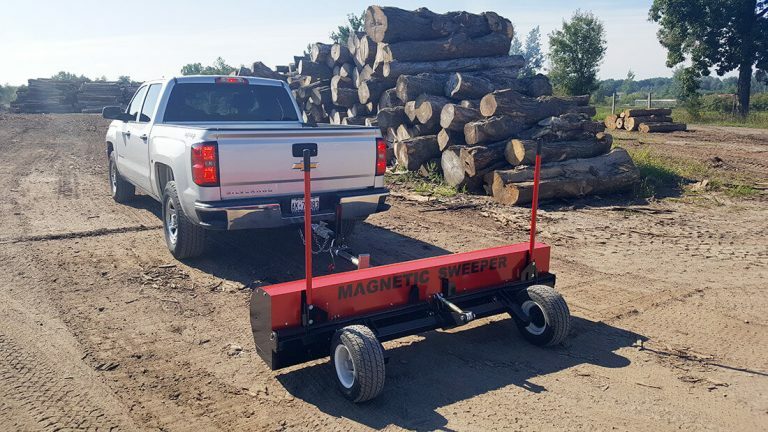 Therefore it’s important that the magnet can be mounted and dismounted from the Pickup Truck quickly and easily, or alternatively, the magnet can be locked into a position where it will not interfere with normal operation of the truck when not being used for sweeping. If not, then the tow behind solution may be best for you because it can be easily and quickly hitched up when needed. 5. How easy is the magnet to clean off? A magnet may work really well at picking up debris, but how easy is it to clean off? Think through how you would clean the magnet off step by step. Make sure it makes sense to you and your situation. We try and do this for you so that clean off isn’t a difficult or time consuming task, but some manufacturers don’t. Pay attention to the details of how this will work from start to finish, right up to the point of getting the debris in the garbage or scrap bin. 6. How good is the magnet at hanging on to the debris that it picks up? 7. How far off the ground will the magnet be positioned? It’s important to know how far off the ground you will position the magnet and also how far off the ground the magnet will still perform. For most of our magnets we give you the “Maximum Lifting Height” in the specs. This will tell you how far off the ground the magnet will perform. We want to make sure our products meet your expectations. Make sure you take a look at the magnet’s specifications for “Maximum in Lifting Height“. We bench test every one of our magnetic sweeper models to determine their maximum lifting height using a two and a half inch standard nail. Everyone knows what a two and half inch nail looks like which is why we use this standard measure of magnet strength and it will give you a very good idea of magnet performance. Many times we have videos of our products picking up various other materials so take a look at the videos in the video galleries. They give you a chance to “kick the tires” and see how the products perform. Many of these videos have been submitted by previous customers. See our Comparison Chart to compare lifting height. The rougher, dirtier terrain your Pickup Truck operates in the stronger the magnet your likely going to want, because the magnet will have to be set higher to avoid constantly hitting the ground. The magnet will also need to pick up debris through some dirt therefore you need a stronger magnet. The rougher the terrain that exists because of things like bumps and pot holes, more you will want or favor a magnet that has some protection built in to the design to either deal with the abuse of hitting the ground or being able to move out of the way when it does hit the ground in order to prevent damage. What do the staff of Bluestreak have to say on the subject of pickup truck magnets? Pickup Truck hanging magnets quite frankly would be my last option, only because truck suspensions cause a lot of bounce, that can cause magnets to hit the ground. You don’t get that with front mount or trailer tow behind units. So if you need to use a hanging magnet, make sure there’s some protection from hitting the ground. 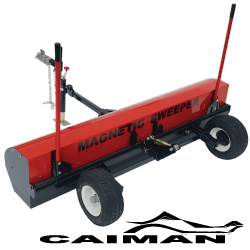 The ISO magnetic sweeper is a hanging magnet design specifically designed for highway maintenance operations. The ISO design allows you to leave the magnet permanently mounted, enabling you to lower and deploy the magnet for use when needed, and then easily raise and secure it when not needed or for transport between locations. A Quick Clean Off Sleeve makes cleaning debris off the magnet easy! Durability, Power & Easy Clean Off System. The Yacare magnetic sweeper is a 72 inch wide, durable off road tow behind magnetic sweeper with Spring Assisted Clean off that makes cleaning off the magnet easy. 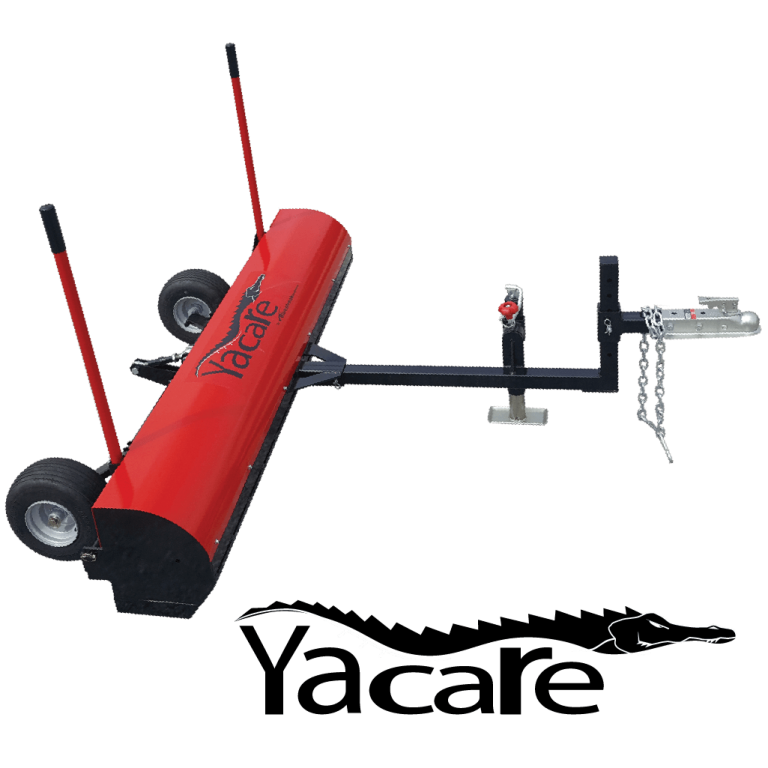 Although the Yacare is a little on the small side to be seen behind full size pickup trucks it’s perfect for smaller or mid-sized pickup trucks. Yacare has the pick up performance for off road conditions provided by the “Wrap Around” design, the adjustable sweep height, flat proof tires, adjustable hitch height and optional debris digging rake accessory. This thing is built like a tank. Check out the CAD drawings. Power & Durability in an 82 inch width. Similar to the Yacare Only Bigger! 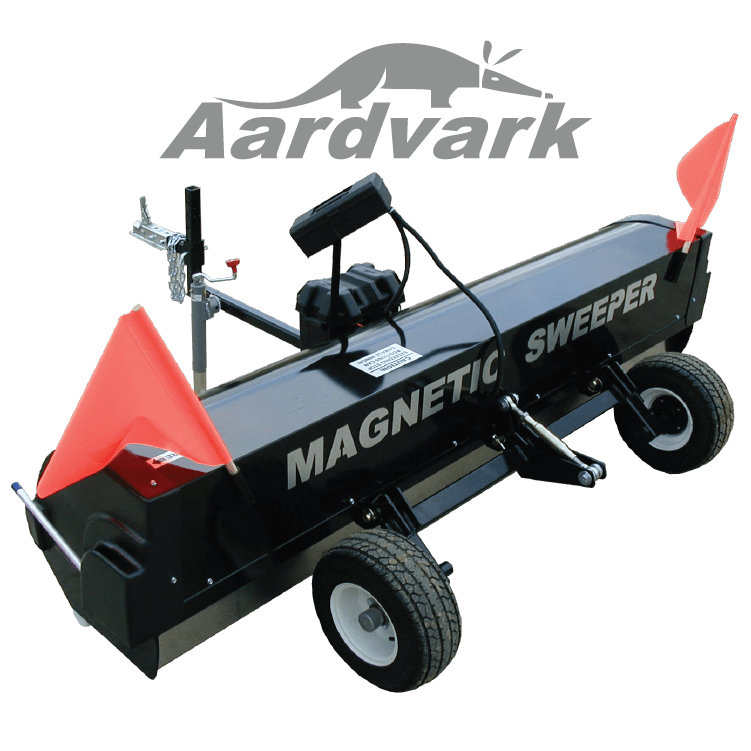 The Caiman magnetic sweeper is one step up from the Yacare magnetic sweeper. Like the Yacare, the Caiman magnets are enclosed and it has Dual Spring Assisted Debris Release Handles to make cleaning off the magnets easy. However, the Caiman is wider with an 82 inch width and it has much more power with 50% more magnets than the Yacare. The increased power and wider sweeping width make the Caiman a good choice for towing behind pickup trucks. The Caiman also has solid pick up performance in off road conditions provided by the “Wrap Around” design, the adjustable sweep height, flat proof tires, adjustable hitch height and optional debris digging rake accessory. Check out the Caiman CAD drawings for details. The Aardvark magnetic sweeper is a tow behind magnet design specifically built for off road, uneven or rough gravel dirt road conditions such as found in large landfills, industrial sites, mines, mine haul roads, logging roads, etc. Fully enclosed and automatic clean off and a lot features specifically for harsher conditions. 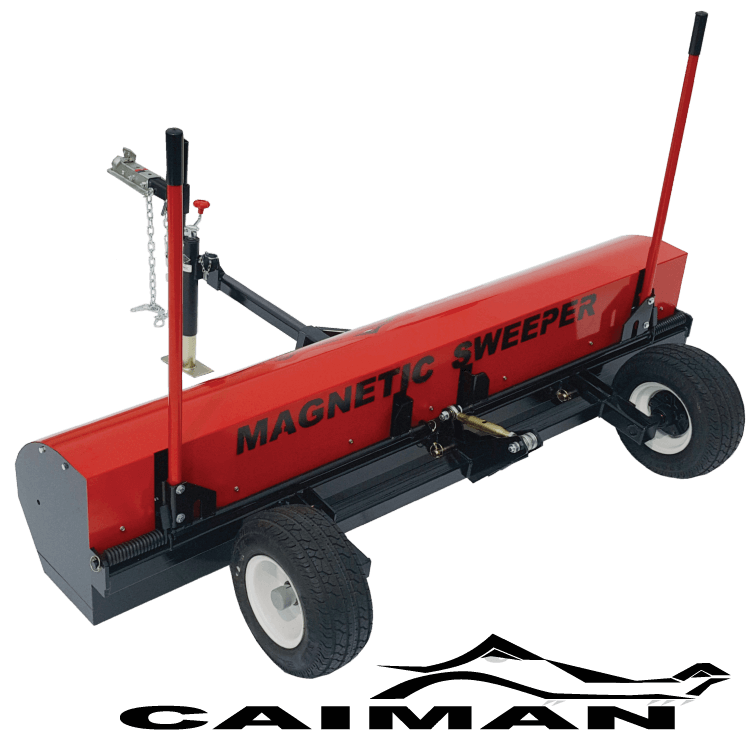 The Piranha magnetic sweeper is a tow behind design magnet specifically built for flat on road conditions, parking lots, airfields, etc. A simple design that looks similar to other flat surface tow behinds on the market but is a cut above the rest. Easily attach to pickup trucks in a variety of positions. The Wrasse magnetic bar is the most economical hanging design option because you’re paying for just a big magnet bar. Hang it underneath with the two included mounting chains and you’re off and ready to go! The Wrasse comes in three different magnet strengths and different widths to suit your budget and needs. But if your vehicle bounces around a lot such that the magnet could hit the ground a lot as well, this may not be the best option. Maximum Lifting Height 9 3/4" 10 1/2" 9" 12" 11" 4 3/4" 6" 8 1/2"
Sweeper Height Adjustment 2" to 6" Continuous Adjustment 2" to 6" Continuous Adjustment Continuously adjustable. 1.5" to 6" Continuous Adjustment No Adjustment. 3" clearance with sweepers down, 7" clearance when traveling with sweepers up and not in use. Change suspension height by rising or lowering the chains to a maximum height of 3". Change suspension height by rising or lowering the chains to a maximum height of 4". Change suspension height by rising or lowering the chains to a maximum height of 5". 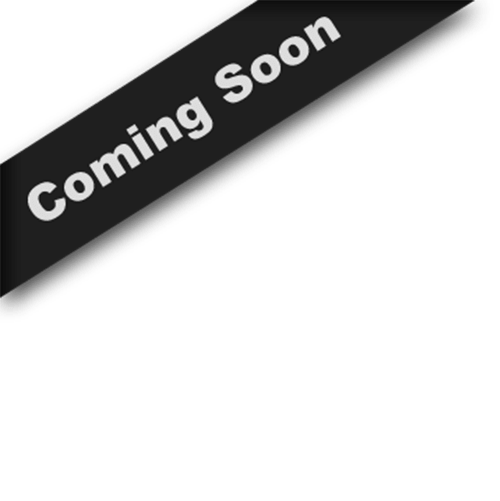 Clean Off Method Spring Assisted Dual Debris Release Handles Spring Assisted Dual Debris Release Handles Comes standard with a Quick Clean Off Sleeve Automatic, push button Slingjaw clean off system. Magnetic housing rotates up side down, debris falls into debris holding trays. Wipe clean with glove or rag. Wipe clean with glove or rag. Wipe clean with glove or rag. Also available with a Quick Clean Off Sleeve accessory.